Castle Island anchors Pleasure Bay Beach at the northern tip of a 3-mile stretch of South Boston beaches looking out onto Dorchester Bay. 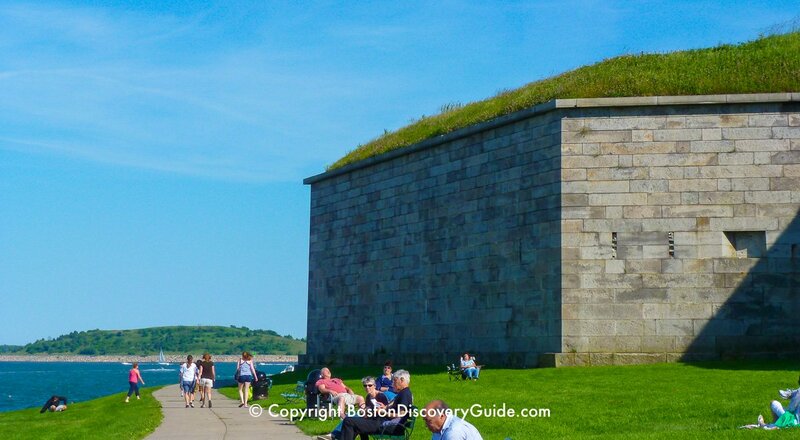 At the top, historic Fort Independence overlooks the Boston Harbor Islands, offering gorgeous views and usually a cool breeze. For a special, "Boston Insider" experience, visit Castle Island on July 4, when "Old Ironsides" - the USS Constitution - makes her annual turn-around cruise from Charlestown Navy Yard. Once she reaches the fort, she turns and fires a 21-gun salute to the nation to commemorate the fight for independence. Famed landscape designer Frederick Law Olmsted designed Pleasure Bay Beach next to Castle Island in the 1800s as a marine park, a jewel in his "Emerald Necklace" of green space surrounding Boston. Pleasure Bay includes 22 acres offering some of the best views in this part of Boston. Best of all, you can get here in 15 minutes or less from the city. Pleasure Bay Beach circles around to the west and south of Castle Island, offering protected swimming areas along the sandy edges of the lagoon, although the beaches further south along Day Boulevard offer whiter sand, lifeguards, and reportedly fewer jellyfish. Most people come to Castle Island to enjoy the views, have a picnic, and stroll along Harborwalk, which merges with Head Island Causeway around Pleasure Bay itself. Castle Island's location almost directly across the mouth of the Mystic River from Boston Logan Airport means you can watch planes swoop down over the water and land on the runway - big hit with kids! If you're visiting with young children, head to the fenced playground near the beach. If you're coming with older kids, keep in mind that the grassy slopes surrounding the fort provide a perfect place for flying a kite or tossing a frisbee. 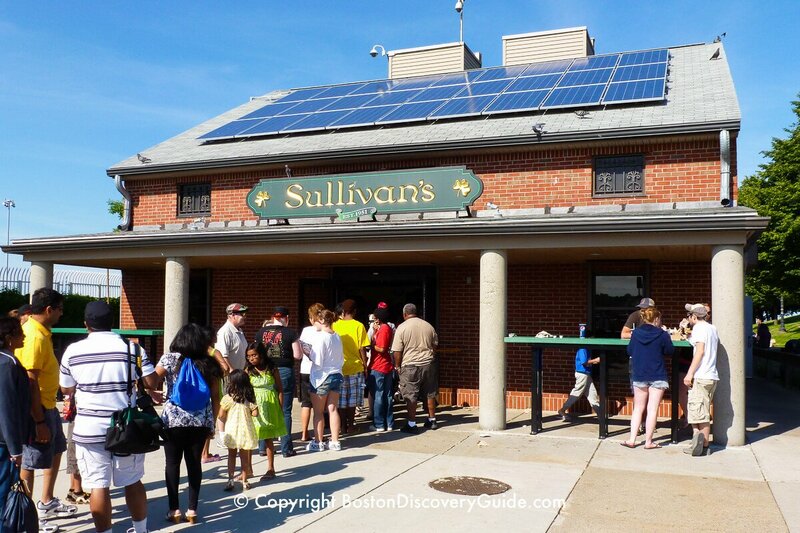 Inhale the salt breeze, stroll over to Sullivan's (locally called Sully's) for fried clams and ice cream during the summer, and soak up some sun. 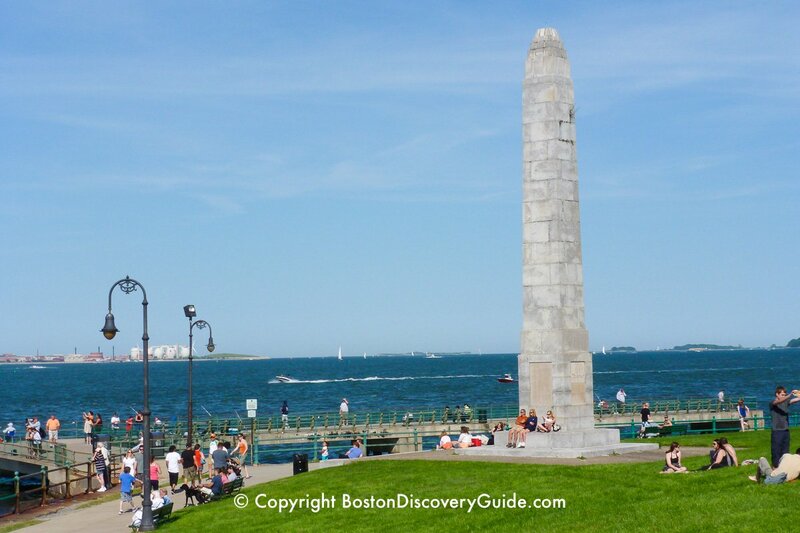 Want to see more of Boston Harbor and the Boston Harbor Islands? These sightseeing cruises are the best way to explore! Castle Island may not be the "perfect" place to view Boston's July 4th fireworks. After all, the fireworks launch spot in the Charles River is almost 3 miles away and a good-sized chunk of downtown Boston buildings will be between you and the launch site. However, you can still see a lot. 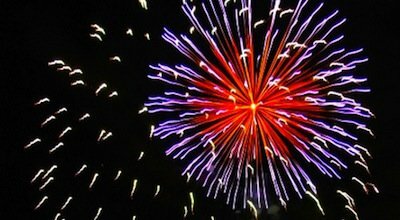 Arrive early enough to stake out your spot, and as a bonus, you can see fireworks from a couple of other nearby communities as well. Most of the million or so celebrators who flood into Boston for New Year's Eve festivities congregate in areas closer to the First Night events and NYE parties to watch the fireworks, so you can usually find a great fireworks viewing spot at Castle Island relatively easily. 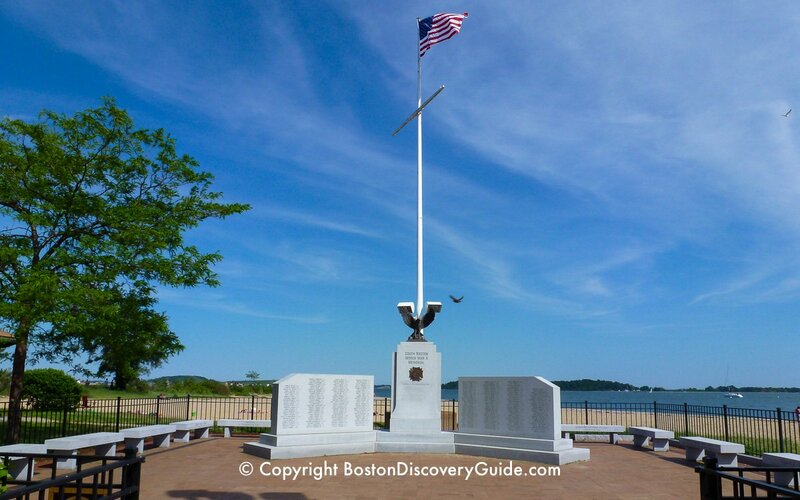 Near the beginning of the narrow causeway leading out to Castle Island from Pleasure Bay Beach, you'll see one of Boston's newer war memorials. The 2 large granite blocks flank an American flag. Walk over and you'll see that it is a memorial to South Boston residents who died fighting in the war. To get to Castle Island from Boston, hop on the Number 9 bus at Copley to City Point and then walk out to Castle Island. Alternately, rent a Hubway bike and ride out. Castle Island's location just a couple of miles from Downtown Boston makes it the area's most popular beach. 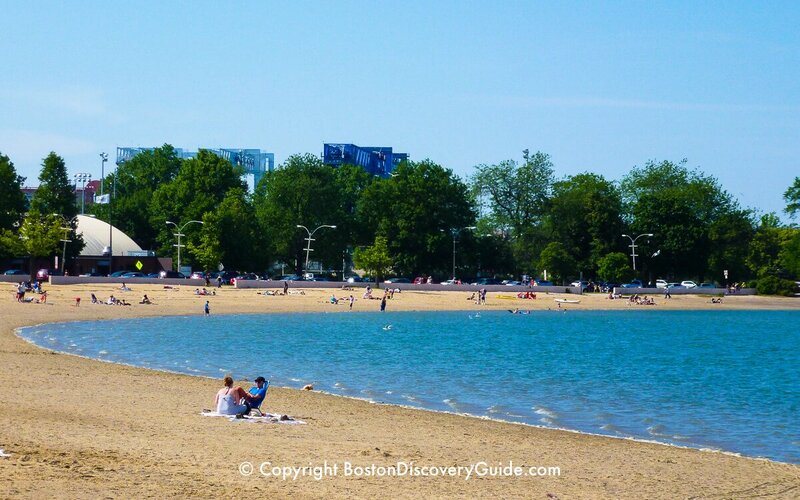 Castle Island, Pleasure Bay Beach, and the other South Boston beaches are free to the public - no admission charge. 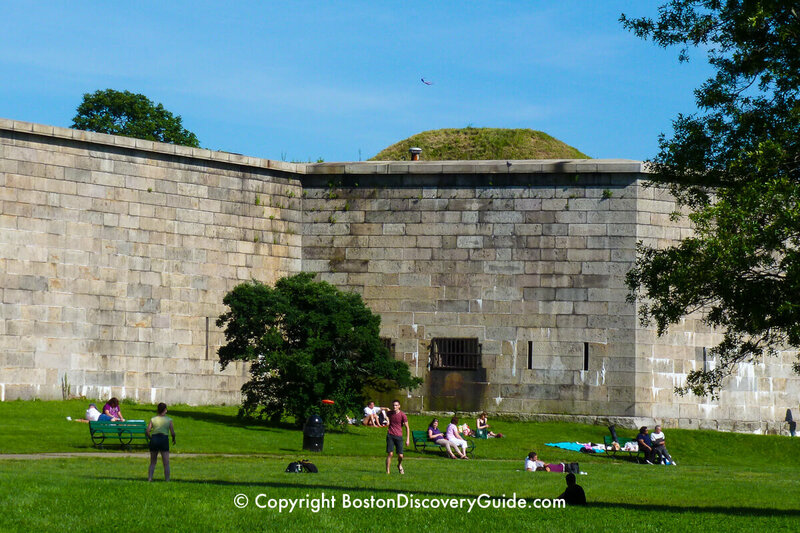 At the top of Castle Island stands Fort Independence, a massive 5-pointed gray granite structure built between 1834 and 1851. What you see when you visit is actually the 8th fort to occupy this site. 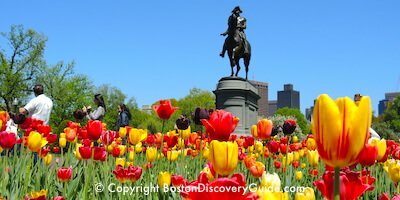 British troops destroyed the first one, built in 1634, as they fled Boston during the Revolutionary War. Fort Independence prevented British naval attacks during the War of 1812 because of its strategic location. Boston-born fiction writer and poet Edgar Allan Poe served at Fort Independence in 1827 after lying about his age and enlisting in the U.S. Army as "Edgar A. Perry." Literary rumors cite the old fort, or a story Poe heard while stationed there, as inspiration for his famous 1846 chiller, The Cask of Amontillado. You can join free 1-hour tours of Fort Independence on most Saturdays and Sundays between Memorial Day and Labor Day and on Columbus Day weekend, and walk on top of the fort (be careful!) without a tour guide for city skyline twilight viewings on most Thursday evenings during the summer. 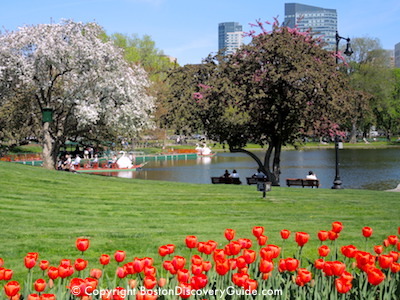 New England Aquarium - Next to the whale watching cruise dock, and a top Boston attraction!